Leighton Baines vs Jack Rodwell – Which One Could Be A Male Model? 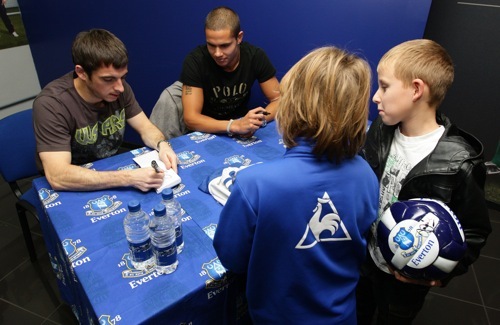 Everton’s Leighton Baines and Jack Rodwell model new EFC casualwear at the club shop. Of the two, you have to say (© Graham Taylor) only one looks really comfortable doing the model thing. And it’s not little Leighton, bless him. Not much of a model, but a hell of a player. Seriously underrated is Leighton, he’s top class. Yeah, from what I’ve seen of him this season, he’s playing really well. In defence and a attack, as a whole package, Baines is England’s best left-back by miles. Sorry Binnsey, but Ashley Cole would beg to differ. Cole in a different league to Leighton. Agree with Ollie. Am a HUGE Baines fan (and a huge Everton fan) but Cole is better. Give him a few years and he may close the gap though. Sorry Binnsey…..as good as Baines has been this season, C’ashley is still by far one of (if not the best) left backs in the world. Yeah, Ashley Cole is Englands best player at the moment. World Class. Leighton should be his deputy…another class act. As for Rodders, we all know hes a different class…much better than barry, carrick and huddlestone etc. Really think these two are world beaters? Or you being english again? Build them up, keep adding the $$$$$ to their name. Gareth Bale is a player!